“Downhearted Blues” was her first hit and is considered by many to be the first authentic blues record. Listening to her sing, it is easy to forget that this was still a purely acoustic recording, without the benefit of an electronic microphone. Her voice is measured, even reserved, as is fitting for the subject matter, and yet such is the power of that voice that no subtleties are lost in the delivery. It is a moving and beautiful performance. 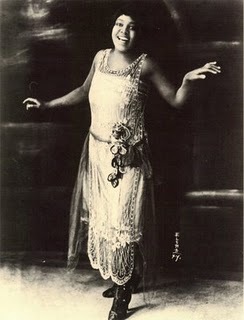 As powerful as that record is, it almost pales in comparison to “‘Tain’t Nobody’s Biznesss If I Do.” With well-suited accompaniment from Clarence Williams on piano, Smith sings a tale of defiance and self-determination, proclaiming that no one can tell her what to do with her money, body and soul – even as her behavior becomes increasingly self-destructive. Williams knows just when to hold back, as he stops playing momentarily several times in the second half of the song to give further weight to Smith’s words. 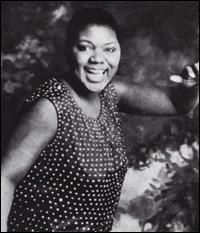 “Gimme a Pigfoot” shows Bessie Smith at her rawest and best. Vocally, she pulls out all the stops, hitting the typical highs with her powerful voice, but also unapologetically hitting all the lows with a snarling growl. By the time she sings, “He’s got rhythm – yeah!” there’s no doubt where the song is headed. The rest of the devil-may-care lyrics only add fuel to the fire as Smith calls for not just a pigfoot and a bottle of beer, but also for refer and gin as she demands a good time. The accompaniment reflects the bluesy rowdiness as well, with the lead piano (by Buck Washington) and trumpet (by Frankie Newton) parts played playfully and loose. Newton’s trumpet solo, in particular, is wonderful as it slurs through the meandering notes and slides drunkenly into the final verse. Also providing colorful touches are swing legends Jack Teagarden on trombone, Chu Berry on tenor sax and Benny Goodman on clarinet.